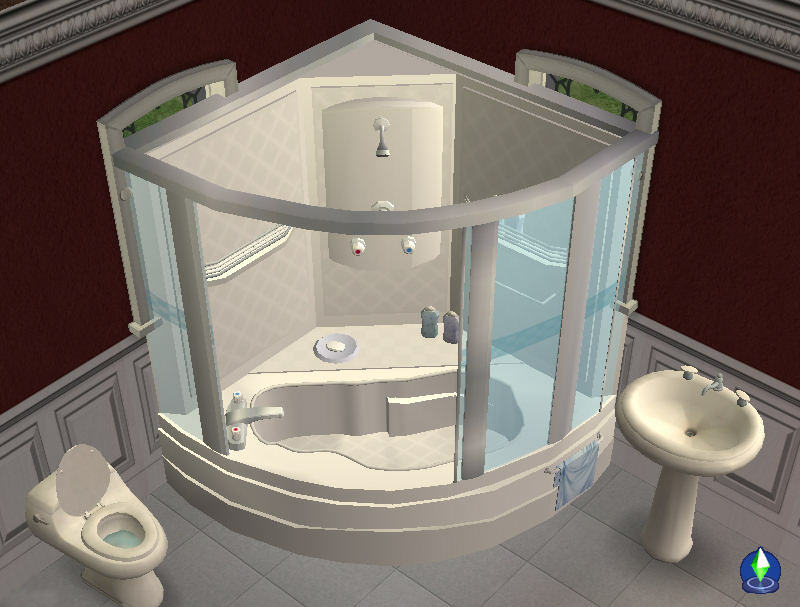 Corner Bath and Shower Unit - Pro - Bathtub Works. Pick you self up of the floor and sit back down, Stop pinching yourself and rubbing your eyes. NO your not dreaming this is Real! I’ve been do this all week, I've add glass textures to the original corner bathtub package and created a NEW Model (Mesh) unlike any other Sims 2 bathroom units. I’ve also done the water animation textures again to make it better, and I have removed un-need code and mesh parts form the package. Plus hole lots more, days and days of work. But the result is nothing less than spectacular. This supreme unit will add class to any bathroom making the environment more welcoming, even the smallest of bathrooms. The Bath and shower Professional model features heated glass with built in micro wires that emit a negative electronic charge repealing water so you will never have to worry about fogged up glass again. The Power plus adjustable Water jets will relax you like never before whilst cleaning you at the same time, and if you still want more its fitted with a heated tub ensuring that the water never get cold no mater how long you in there. Yes and there’s still more the Bubble master 2006 mixes the bubble bath mix automatically so you won’t have to worry about the waters PH levels and be massaged by the Vibration system which gently vibrates the tub whilst you relax giving you that perfect gentle massage. Comes in wide range of colours: Yellow, Blue, Green, Purple, White, Peach, Pink, Black. Note: This may not happen for all of you but the catalogue Icon in the game may have blue glass for the design tool. I’m trying to work out what is doing this. I love to be thanked and love to hear what you think so please post. Use's My Owen unique GUID, if you have a conflict tell me. Don't post my work on any website's without my permission. You May Recolour this. But the recolour must stay on this web site unless I have given other permission. The Base object may be cloned but don't use this Mesh (Model). I Give my Permission to use the texture is this file for Re-colours. The object needs to be extracted form the download with a zip extraction tool such as ALzip. If you don’t have a rar or zip extractor, for a free unzip tool (ALzip) go to. This zip file also contains a Read Me Documentation file in pdf format. This may help some of you. 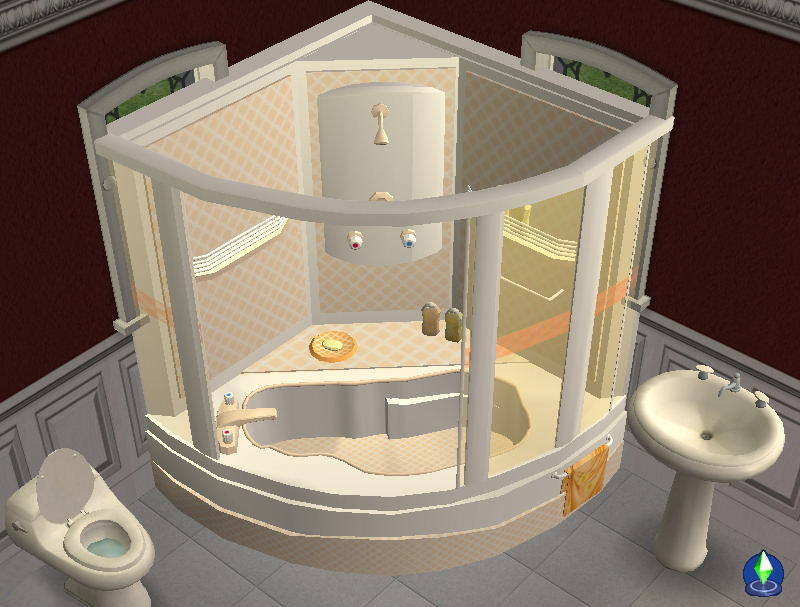 MTS-Corner-Bath-n-Shower-Unit-Pro full working.zip | Description: Updated Shower Bath Unit working bath and working shower in game, sorry for late upload.. Lifes hard.. These recolours may or may not be endorsed by mickyss. Minor Update 12/21/2008: - baby/toddler/kids room "far from perfect"